Mix together the sugar, salt, pepper, cayenne, paprika, garlic powder, cumin, coriander and thyme. Remove the backbone from the chicken then flatten. Pull out the breast bone, then cut through the breast meat to divide the chicken into two. 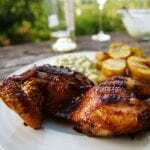 Sprinkle the rub all over the chicken then rub in well, if possible, leave chicken to marinade for 2 hours. Drizzle the chicken with olive oil, then place skin side down on medium coals and leave to cook gently on the skin side for 25 minutes or until skin is crispy and golden. Turn the chicken over, then cook on the other side for another 25minutes or until the chicken is completely cooked through. Slice courgettes into quarters lengthwise to make long wedges. Toss with olive oil, seasoning and lemon zest. Cook on the braai until charred and tender. Squeeze lemon juice over courgettes before serving with the chicken.